The results of a comprehensive field trial to test whether its hydrophobic oligonucleotide tracing technology remained stable in various waste oil tanks in the marine environment, have wholly validated Forecast Technology’s (FTL) innovative technology. The purpose of this patented technology is to allow ship owners to ‘mark’ their oils with unique tracers, which remain present even when the oil comes into contact with sea water. By testing samples of the spilled oil, presence (or lack thereof) of FTL tracers will conclusively help owners eliminate innocent vessels from investigations whilst enabling authorities to conclusively identify the actual source of a release. FTL’s range of oligonucleotide tracers have been modified to give an increased affinity for hydrocarbon oils. This modification ensures the oligo remains in the oil phase and does not migrate into any surrounding water, even if the oil is only present as a very thin film on the surface of the sea. This standard had been confirmed in laboratory tests, and a comprehensive trial was then required to ensure that the tracers could be easily added to waste oils on board a vessel, and sampled to ensure that the tracers remained stable in the waste oils for extended periods. 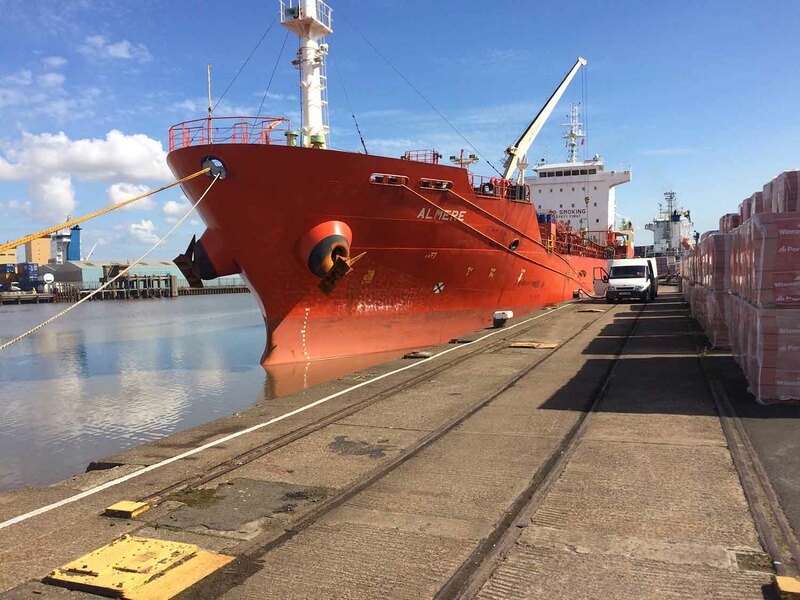 The trial, conducted by Minton, Treharne and Davies Ltd, was named the ‘Almere Trial’, taking its name from the Union Maritime oil products tanker (13,053 DWT) used in the field testing. Trials were held in two port location: Thurrock in the UK and Valencia in Spain. During the trial, the mineral oil containing ~0.5mg of oligo tracer was simply poured into the top of the relevant tank sounding pipes or directly into the bilge well area surrounding the bilge suction points. A sampling technique, mimicking the ullage measuring system was subsequently employed to take samples of the waste oil from the tanks. Results of these tests showed that the tracers would be readily detectable in waste oils for at least three months after the original application. Commercial vessel owners have identified a range of benefits from using this technology, including the ability to significantly reduce the costs associated with false claims of illegal polluting, due to the ability of the vessel owners to prove innocence within hours and the ability of the authorities to take appropriate action quickly and reliably. In addition, the technology will form a part of the vessel’s ISM compliance, improve its P&I rating and help owners build a good reputation by providing proof of environmental responsibility. As part of both business development and business interruption planning, it enables owners to have confidence in the protection of their vessel and crew, both operationally and as business assets. Regulatory feedback has been similarly conclusive, as bilge and waste oil dumping is a key concern. So, in addition to the improved protection of the marine environment, regulators see considerable potential in enabling only approved, tagged or fingerprinted vessels to be permitted into controlled waters. FTL technology is seen as a valuable potential tool for enforcing controls in Marine Protected Areas, and regulators would expect to see both an increased number of prosecutions for illegal discharging, and a significant reduction in the time and costs associated with identifying the culprits of this type of pollution. A full copy of the Almere Field Trial Report and the reports showing the conclusions of FTL’s laboratory tests are available on request.